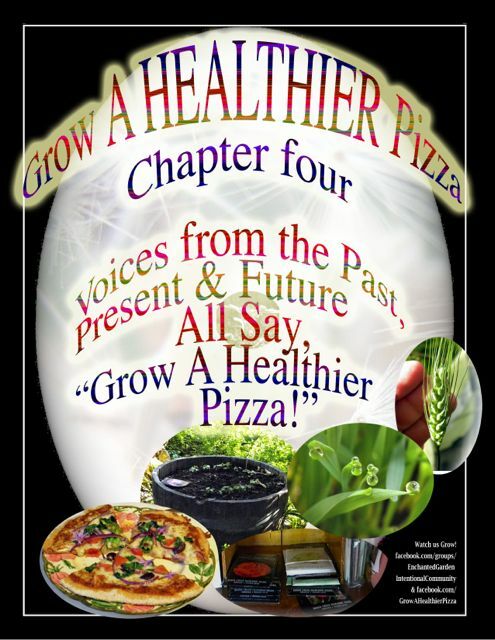 VOICES FROM THE PAST, PRESENT, AND FUTURE ALL SAY "GROW A HEALTHIER PIZZA!" This Material is going into Chapter Four of "Grow A Healthier Pizza," The book. This Plant Your Dream Blog was written during the Campaign to Grow A Healthier Pizza 2012, and needs to be worked over. This material needs a major work over. The idea is to have quotes from various Voices I admire from the past, and present and future. The future are the Youth. "Grow A healthier Pizza!" is a metaphor for grow some of your own food, and to claim the Right to Know what is in your own food. It also is a challenge to grow some of your own food as a way of 'outgrowing" the need for Special Interests who are more than willing to step in and grow our food for us. Best we take charge of our food supply. Co-founder of Rancho La Puerta and theWellness Warrior Deborah Szekely Movement. The Voice of Emanuel Bronner from The Moral ABC's is talking to me now. "For with Bombs & Guns we're ALL-ONE or none! ALL-ONE!" He Concludes, " Grow a Healthier Pizza!" "It will be a long time before Congress will successfully grapple with the facts..."
"The work must be done in the schools. Dr. Wiley was the “father” of the famous Pure Food and Drug Law of 1906 and the first head of what would later become the FDA. The Lee Foundation republished his autobiography after the original manuscript was “lost” by the Macmillan Publishing Company and after the book had conspicuously disappeared from every library in the nation. In it, Wiley sets the historical record straight as to how the food industry corrupted the nation’s laws and politicians in order to sell cheap, refined, adulterated, devitalized “foods.” The industry’s usurpation of federal laws and regulations regarding whole foods is an example of American politics at its worst. Original publication date 1929; republished by the Lee Foundation in 1955. As Fast as a Blade of Grass! When I Touch Grass, I touch Infinity..."
Sign the '7.5 Million + 2 Petition today. and mysterious power in it--the power of life. from "The Book of Asha,"
truth more abundant truth, the seed more abundant seeds. "The Essene Book of Asha." VOICES FROM THE PAST, PRESENT, AND FUTURE ARE SPEAKING NOW. ALL THESE VOICES LEAD TO ONE CONCLUSION, "GROW A HEALTHIER PIZZA!" "The Grain of the Prophet is in the Recesses of Every Human Existence"
Rabbi Joshua Abraham Heschel carried a small Torah, the Sacred Scroll of the Old Testament, as a Freedom Rider in the 60's with Rev. Dr. Martin Luther King. The quest then was for freedom. The Freedom Ride continues this September as we reclaim our heirloom seed heritage and outgrow our current food emergency. Caravan to The Second Annual National Heirloom Expo, September 11,12 &13, 2012. Rally now to claim victory for the California Label GMOs Ballot Initiative Nov 6. 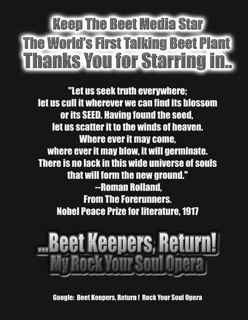 This i a composite goes of the Voices I am quoting in my Walking Papers for the Journey To Win Back Our Sacred Seeds. I am working very hard to Win Back My own Sacred Seed this Morning. I am feeling the stress that comes from attempting to go beyond my normal capacity. I am using FES Remedy Mind-Full for Mental Coherence as I write. I WELCOME YOU TO SIGN THE "7.5 MILLION + 2 PETITION NOW! Maura Richman, a Sacred Seed in my life, gave $5.00 on Friday June 22, 2012 to help me Win Back Our Sacred Seeds. A portion of this money will go to help with the Overgrowth Cleanup at the Enchanted Garden Intentional Community. I am hiring former military men, gardeners who want to farm, and students in need to work with our Arundo Donax Learning Experiment and our Overgrowth Cleanup. I want this property to be held for future generations as a living archive for food growing and community learning to come together. A portion of the money will go to help with the preparation for the Caravan, September 1-10, 2012 to the Natiional Heirloom Expo. 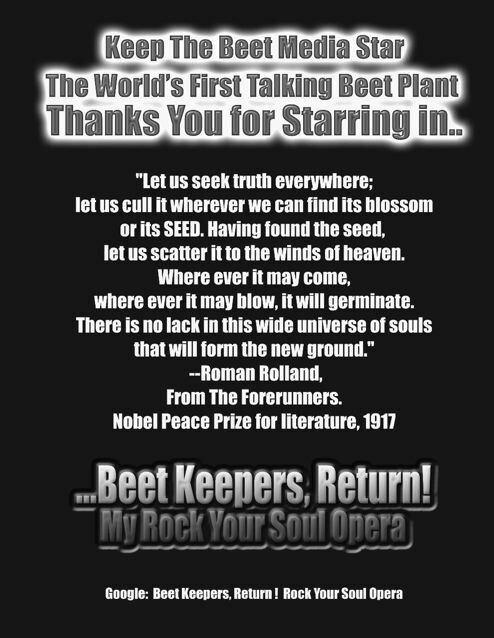 The List of those who have contributed to Help Me Win Back Our Sacred Seeds is here. These are stories for publication about the International "Grow a Healthier Pizza! Campaign and the '7.5 MILLION + 2 PETITION' That intends to help Co-Create the Greatest Grass Roots Movement In California History. "Let us seek Truth everywhere. let us scatter it to the winds of heaven. where ever it may blow, it will germinate. I write everyday on the Plant Your Dream Blog. I have started the '7.5 Million + 2 Petition' on Change. org. I want to be part of the Greatest Grass Roots Movement In California History that says, "Grow a Healthier Pizza!" To 'Plant Your Dream," we each need to be guaranteed we are getting healthy food. For me, this means, Label GMO's because I have a Right to Know and a Right to Choose what I am eating. I am committed to help you Win Back Our Sacred Seeds. One Leg of this Journey is the Caravan, September 1-10, 2012 to the National Heirloom Expo, September 11-12-13, 2012 in Santa Rosa, California. * '7.5 MILLION + 2 People voting yes is the projected Number we will need to win this based on The California number of Registered voters, 15 million. We need a simple majority + a couple for our projected victory.